Maritime Academy, Castine, Maine, served his country during WWl1. He was twice a veteran, serving in the U.S. Merchant Marine in the Atlantic and in the Mediterranean Theater as well as in the South Pacific with the Navy. Awarded the Merchant Combat star, Ray remained in the Naval Reserve, achieving the rank of Lieutenant Commander before retiring in 1972. Town City Council. He was also a lifetime member of The Knights of Columbus. Penobscot and Piscataquis Counties, his wife and the eight cherished children. family and friends who also summered there. 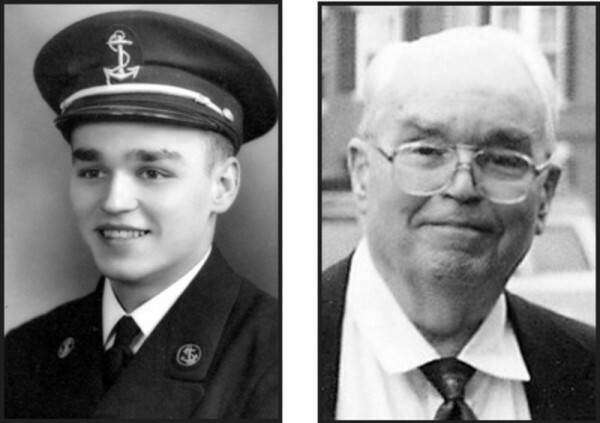 cousins he grew up with, the men and women with whom he shared the experience of World War II. He is survived by seven children, Margaret Morehouse, Anne LaBree, Tabitha King, Christopher Spruce, Thomas Spruce, Stephanie Leonard and Marcella Spruce, their spouses, and many grandchildren and great-grandchildren. as well as dear friends, Charles & Ellen Stevens, Frances Trefts, Marion Harris, Ron & Judy Highbarger, Alice & Bill McGowan. Ray had two beloved poodles Stella, aka Fudd and Willie. He will be sorely missed by his current pal Bosco. Relatives and friends are invited to call from 5-7pm Sunday June 1, 2014 at Brookings-Smith 133 Center St., Bangor. A funeral Mass will be held at St. Paul the Apostle Parish, St. John’s Catholic Church, 207 York Street, Bangor on Monday, June 2, 2014 at 11:00am followed by the Rite of Committal at Mt. Hope Cemetery, Bangor. The family invites relatives and friends to share conversation and refreshments at the Family Reception Center of Brookings and Smith, 163 Center St, Bangor following the internment. Gifts in Raymond’s memory may be made to St. Joseph Hospital Chapel, 360 Broadway Bangor, Maine 04401. Condolences to the family may be expressed at www.BrookingsSmith.com.